By anyone’s account, 2017 has been an exhausting year—a stretch of time that, thanks to unending upheaval and the barrage of often bad news, has felt about three times as long as normal. The effects of that are bleeding into every aspect of our lives, including our interest in pop culture. So much has been thrown at us over the past 12 months that it’s harder than ever for music fans to point to one artist or album that stands above all others or dominates the discourse. Even all the chatter and buzz that accompanied big-ticket releases like Taylor Swift’s Reputation and Jay Z’s 4:44 sparked and disappeared with the intensity of a meteor burning up in the atmosphere. 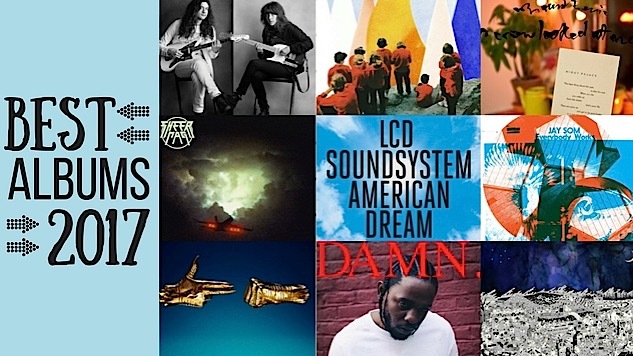 That was certainly reflected in the ballots our music writers submitted for this year’s list of the 50 Best Albums. After all the votes were counted, we took a step back and realized how our listening habits had dovetailed with the social conversations happening around us. It’s a list dominated by an array of female voices, from the agit-punk of Sheer Mag and Melkbelly to the R&B visions of SZA and the late Sharon Jones, to the wonderfully unclassifiable sounds of Kaitlyn Aurelia Smith and Nai Palm. And some of the strongest statements this year came from people of color—not just stars like Kendrick Lamar and Killer Mike, but newcomers like British crooner Sampha and Jasmyn Burke of Weaves—with frankness and intimacy to expose the strains being felt by the people in their communities. At a time when we may feel worn down by the reactionary reversal of social and cultural progress, when we wince at every news alert that blinks on to our smartphone screens, these are the artists we need to hear, the ones who urge us to keep moving forward and inspire our minds and bodies with the simple art of a song.